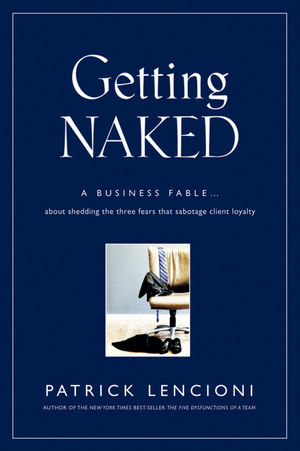 Review of Patrick Lencioni's latest book - "Getting NAKED"
Full disclosure: I'm a Pat Lencioni fan. His Five Dysfunctions of a Team (which even comes in a manga graphic novel/comic book edition!) nails the problems that most teams are experiencing, yet are completely oblivious about. I've purchased and read every book by Pat, and most are pretty good. Getting Naked is great. And even though I am technically a "management consultant," and therefore the situations in the book are more directly familiar, I believe you'll find the lessons just as applicable in your own industry. I had thoughts that the "business fable" had peaked, as there are many people using and abusing this format after Pat had successes with it. However, Pat must've been quietly sharpening his saw because his expert use of the fable format allows the reader to experience the transition of the main character subtly from scoffer to true believer in the concept of deep down, honest, and willing vulnerability. Vulnerability is something I strive for in my company and in my work. I can't tell you how many times people have challenged me with reactions of disbelief to outright scorn when I would intentionally not bring answers to my clients and instead ask 'dumb' questions, willingly looking bad in front of a client to help them "get" whatever they needed to get. I used to have no real response beyond, "Well, that's just the way I do things, because it's the right thing for me." So reading Getting Naked was like getting a permission slip and ammunition at the same time! With Getting Naked, Pat advocates that not only is it good to be vulnerable - it is fundamental in building trust and deep, lasting relationships with your clients. I believe strongly in the leadership practice of walking the talk - meaning we model what we're asking others to do. Somehow leaders (and management consultants) often come to believe that one must be INvulnerable and infallible. Inevitably these folks fall, and fall hard, since being human means making mistakes. I don't want to give away the plot of the book, so I'll skip to the model that Pat reveals through his characters. There are three fears that people in helping roles typically face. Pat leads us to understand that the most effective strategies dealing with these fears are not to posture, defend, and avoid, but instead to step right into the middle of these situations and show our courage and humanity. I've listed each fear, followed by the Naked prescriptions for success. Pat wraps it up with general guidance to Admit your weaknesses and limitations. That is, don't try to cover up or overcompensate for those things you don't do well or you'll be wasting time and energy. I have to say I'm extra-impressed that Pat is following what I call Fractal Teaching, where the example of how to do things is contained in the way that the example is done. By being vulnerable and sharing his own consulting methods, Pat's example is all the more powerful. Thanks again, Pat. I'm inspired and ready to get even more naked than before!